I'm behind the eight ball on this little blog, so thought I'd post a catch up on some earlier scraps from this year, before heading across the Pacific for 2 months while we toured through Canada and the US west coast..
here are my Citrus Twist Kits shares ..
My projects this month were created with the 'Beach Glass' main kit. 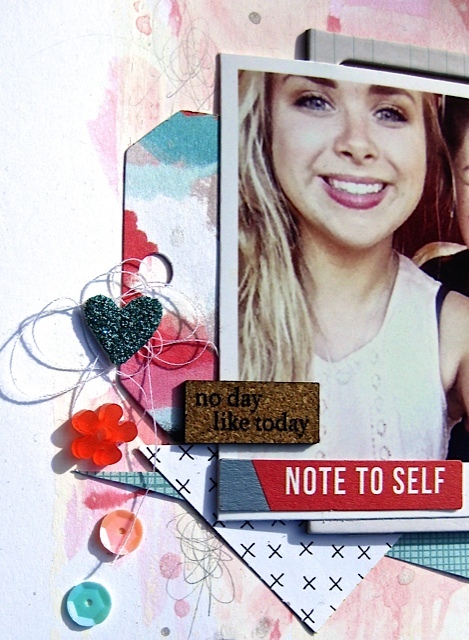 For the first few pages I've used the cute Sprinkles kit as well. I've used mixed media techniques here, starting with some white gesso behind the photo and extending the lime green frame with watercolours and distress stain. April brings another stunning range of kits at Citrus Twist and I had the pleasure of working with the main and embellishment kits this month.. I've used the large die-cut letters and a mask + embellishment on this background..
the beautiful gold embossed vellum goes beautifully with blues and reds.. I'm currently enjoying these painted white frames on kraft.. it adds a contrast between the brights and neutrals.. Finally this one was based on the fun Sunday sketch..
Once again Studio 1440 is sponsoring the latest challenge at Kraft + and it's an amazing challenge this time! I've created a mixed media background using gesso, distress stains, white pen, graphite and stamping.. Check out the full challenge on the Kraft + blog, there's plenty of fabulous inspo to be had! GDT studio 1440 > you climbed a mountain..
Hi everyone! Before we head into a new month and exciting new kits, I'm sharing a few of pages created with the beautiful March main kit 'Sonoma'. Starting with a page, dedicated to a dear family friend - Saphira, seen here modelling her new bandana! how cute is the little wooden peg? Geometrics feature on this page as well, with touches of gold, aqua and pink.. Finally, this quick layout of my gorgeous girls and I came about by accident really.. I pulled out the beautiful sheet of CTK paper in the main kit, and while wondering how I could use it (it seemed a shame to cut up) I noticed the scrap paint sheet next to me and how the colours seemed to go so well with the paper. So I added a few graphite scribbles, die-cuts, wood veneer and alpha and it's made the perfect artsy backdrop! Playing catch up again, this time sharing some creations for Studio Fourteen40.. The snazzy foil flair on this page is hard to photograph but looks gorgeous IRL! the next 2 pages were a bit of an experiment, I had a go at scrapping on A4 card, it was a challenge but I enjoyed it and found the second page easier than the first, so I think I'll persevere with this size from time to time.. 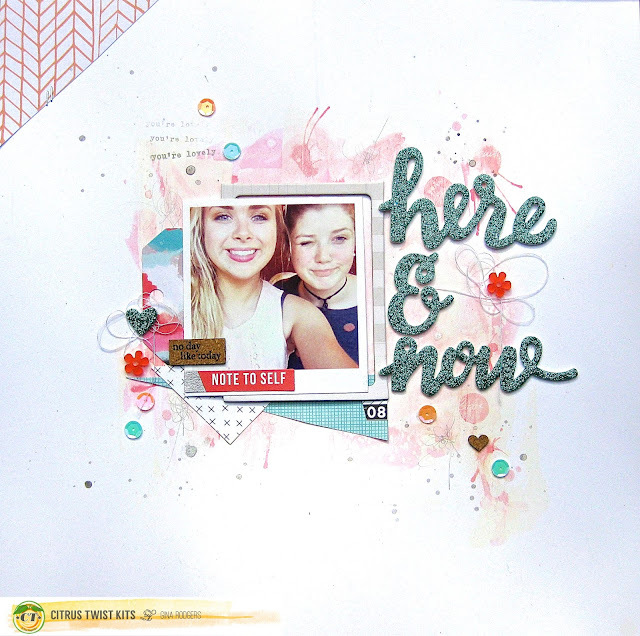 Playing catch-up today with a quick share of my Feb pages using the gorgeous main kit from Citrus Twist Kits.. 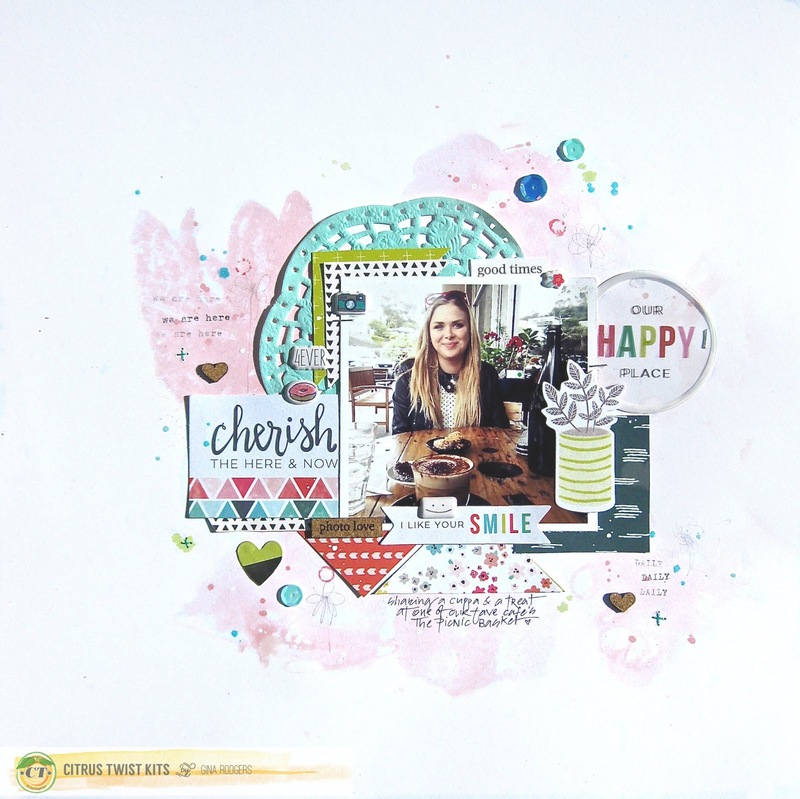 It's my turn to host the fun 3 to inspire challenge over on the Citrus Twist Kits blog. I hope you can join in, upload your layout or PL spread to the CTK gallery or Facebook Fan Page to win a small prize from the CTK store.. I'm back with a few more pages using the gorgeous Jan Main 'Verona' + Sprinkles kits from Citrus Twist Kits. 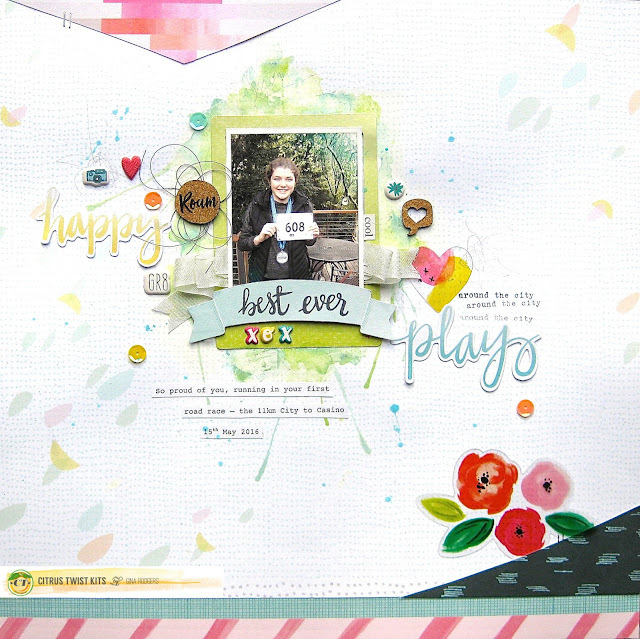 she is cherished > STG..
Not much scrapping has been going on here lately..but this month I'm on the GDT for the Kraft+ October challenge.. along with the lovely Sandra Allan from Studio Fourteen40 and we're sharing posts using some gorgeous embellishments from S1440.. The Challenge this month is such a beautiful one!..check it out here.. it's all about feathers and natural elements and of course the classic kraft background.. The gorgeous wood veneer feathers (original and #2) fit the criteria perfectly. After painting the tips with gesso, added a few silver birch twigs and loosely wrapped them all together in embroidery thread and securing the bundle with glue dots..
and the challenge in more detail.. I'm a bit late posting this..but the good news is there's still time to enter the fun BINGO challenge over at Studio Fourteen40.. you have until then end of this month, and there's lots of options to choose from to create your page.. here's my take, I've gone with the line straight down the middle: glitter, flair, mists and stripes, along with a few extra prompts..